This is a guest blog post by Julia Campbell, a nonprofit digital marketing and online fundraising strategists. Posts with images and videos get shared up to 230% more than those without. On top of that, when people hear information, they’re likely to remember only 10% of it three days later – but if it’s paired with an image, they will retain 65% of the information. 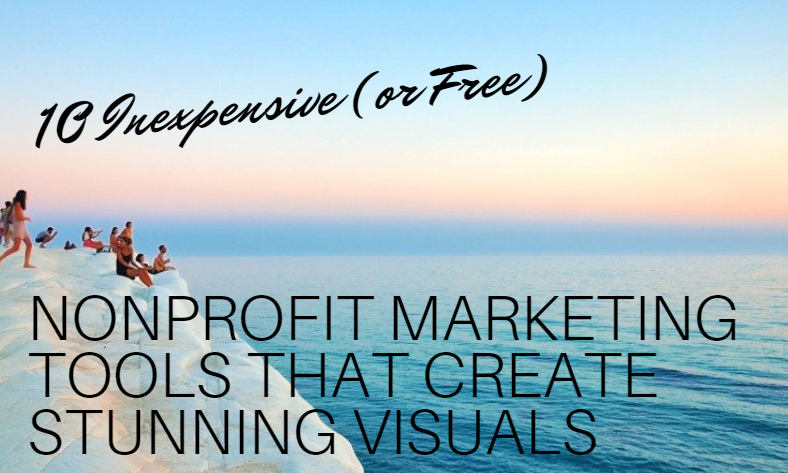 The most successful campaigns I’ve seen take advantage of these fact by creating highly engaging visuals, but how can you do this quickly and inexpensively — especially if you’re a small nonprofit with limited time and budget? To help you out, here is a list of my ten favorite free or inexpensive nonprofit marketing tools. None of these tools require any technical expertise, but can elevate your social media posts to get more engagement. By far, my favorite tool to create visuals of all kinds is Canva. From infographics to ebooks to Facebook ads to email headers and more, Canva is a one-stop graphic design shop for non-graphic designers. They have a huge variety of options available, and the ability to purchase certain elements or stock photos for $1 each. You can also upload your own logos and images to the site and incorporate them into your creations. While I am a devoted Canva evangelist, some of my nonprofit clients prefer Crello. Crello has over 65 million free stock images (whoa!) and boasts 10,000 absolutely free design templates. Similar to Canva, they have templates set up for you when you log in, to get you started quickly and to provide inspiration for your designs. Recommended by Facebook guru Mari Smith and other social media marketing experts, Animoto easily turns photos, graphics, and video clips into an animated video slideshow. Animoto tends to work best when creating short videos for social media platforms Facebook and Instagram because it can easily convert the slideshow to square format. Boomerang is a mobile app that creates a mini-video that plays forward and backward from a short burst of photos. This app is a quick way to create a visual that will catch the eye of your fans and followers in their news feeds, and make them smile if it’s done in a clever way. You can share the Boomerang directly inside Instagram, or save it as a file and upload it to Facebook and more. Legend is a mobile app that can turn simple text into beautiful moving images. There are dozens of templates, backgrounds, and fonts to choose from. Take an inspiring quote or a shocking statistic and put it into animated format to get even more attention and engagement. Who doesn’t love a great GIF? With GIFs.com, you can easily create your own animated GIFs to share anywhere you like. You can also add fun overlays, graphics, stickers, filters, and even your logo to make it more branded and more unique. Need a quick explainer video on the importance of clean water, or the devastating effect of domestic violence on children? Animaker has over 40 templates that you can choose from to create your very own animated video. This is especially useful for nonprofits who have confidentiality challenges in their visual marketing and may not be able to use images and videos of their clients. WordSwag is my preferred mobile app when it comes to text overlay on photos as well as creating beautifully designed text quotes. The Centre Street Food Pantry uses WordSwag to put text over the images that they share to Instagram and Facebook, and received a 150% increase in likes and comments in just 2 months. Choose from their backgrounds and stock photos, or upload your own! WordFoto is a mobile app that takes the saying “a picture is worth a thousand words,” literally. Using your words and phrases, the app turns them into stunning works of art, that you can download or share to your favorite social media platforms. Lumen5 turns your blog or long-form content into a video. Trust me, this one is a game-changer. I uploaded my blog post “10 Simple Ways Nonprofits Can Prepare for A Successful #GivingTuesday” into Lumen5, edited the text on the slides, chose some photos to go with the text, chose some music from their library, and voila! Off to the races. It probably took me about 2 minutes to get the video exactly how I wanted it. No editing, no technical knowledge necessary. And the version that I used did everything I needed for free. After your video is created, you can share it directly to Facebook or download the video file and share it wherever you like. Visual marketing takes a bit of creativity and forethought, but if you explore using the tools I’ve detailed above, the work will become much easier. If you have any favorite visual marketing tools to add, let me know in the comments. Julia Campbell is one of the most well-known nonprofit digital marketing and online fundraising strategists. She offers a number of free nonprofit webinars and courses on her website and she is the author of Storytelling in the Digital Age: A Guide for Nonprofits. Hi Terry, just wanted to let you know about another site called Design Wizard (designwizard.com) it offers all features free including magic resize, font uploader and custom color palettes. I hadn't heard about a couple of these. I use Easil.com and in the past have used Stencil.com too. Both have free versions I think so worth letting your non-profits know there is plenty to go around for them! I'm just about to start playing with Animoto - have heard great things about it. I've used Canva and Animoto before, and they're pretty user-friendly. Picmonkey is also a nice tool - there are a lot of really fun fonts and templates you can use. It's $48 a year for the paid version which is reasonable. It's not a tool, but I love https://unsplash.com/! It's a great spot to get 100% free images, and the images there are amazing!! Also, https://pixabay.com/en/videos/ has some really fantastic short stock videos. They're great for GIFs or you can even string a few together and add a voiceover for a unique nonprofit video! I go over how nonprofits can use video to share there message in this post: http://patrickjliddy.com/blog/using-short-videos-to-spread-your-nonprofits-message. Take a look if you like and let me know what you think!